Star Wars junkie Mark Dermul has a pretty sweet job: He leads tours in North Africa of different locations featured in the films. 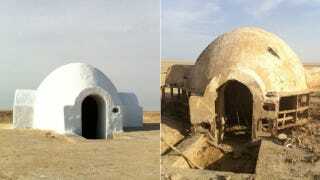 On a 2010 trip to Tunisia—er, Tatooine—he and his cohort realized that Luke Skywalker's boyhood home—the Lars Homestead—was in serious disrepair. NPR reports how they brought it back to life.